Brad Feld has a great post, No More MBOs, where he puts into question the usefulness of MBO-based bonuses in startups. It’s a good read, including the discussion. I agree with Brad that linking bonuses to MBOs can be messy, so let’s abolish that. But, let’s not throw the baby with the bath water. Let’s not give away MBO all together. Let me start with a historical perspective on MBOs and its usefulness. Hewlett-Packard is the company that popularized the practice of Management by Objectives. I have some deep history with the practice of Management by Objectives, having worked at Hewlett-Packard for 14 years, most of them as a manager. And I was involved in several MBO planning sessions, implementations, performance appraisals, salary reviews, ranking sessions, etc., all that fun stuff that big companies do. Peter Drucker wrote a chapter, entitled “Management by Objectives and Self-Control” in his 1954 book The Practice of Management. But that didn’t have near the depth of implementation details that came later when HP practiced it, and made it an integral part of “The HP Way”. 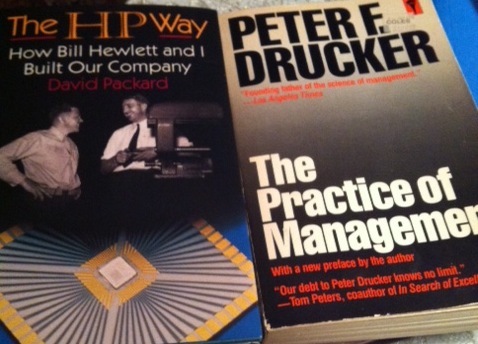 In 1995, two years prior to his passing, David Packard published the book “The HP Way: How Bill Hewlett and I Built Our Company.” I remember when a copy of that book showed-up one day on my desk. Each of the 100,000 employees received a free copy. In that book, Packard wrote “No operating policy has contributed more to Hewlett-Packard’s success than the policy of management by objectives.” Indeed, MBO had been a fundamental part of HP’s operating philosophy since the very early days of the company, which was founded in a Silicon Valley garage in 1939. MBO was conceived when Hewlett and Packard realized that the only way to manage their growing number of employees that were scattered in different locations, was to assign them objectives, but to give them the freedom to achieve them in the ways they determine best, in their own areas of responsibilities. A key part of the MBO process is that these objectives had to be clearly communicated and linked to each other, and across departments. MBO was the philosophy of decentralization in management, and it was anti-micro-management. It was about how modern enterprises were going to be managed. Later, in 1976 HP’s subsidiary in Japan (YHP) evolved MBO into what was called the hoshin process, from the Japanese words hoshin kanri, which meant direction setting. What hoshin did was to put more rigor into the MBO planning methodology, specifically on the cascading effects and how objectives, strategies, objectives and measures were all linked together. I remember very well the hoshin planning process, because it was tedious and very detailed. We were handed tables with a specific format that we had to follow, and progress was reviewed monthly. You couldn’t have slides without your hoshin tables in them, during a management review meeting. It was one of the first things you had to talk about. It really kept the whole organization well informed, on-track, focused and well managed. Fast forward to 1999, when John Doerr introduced OKR’s to Google’s leadership, when they were less than a year old, Objectives and Key Results. It was really a simplified version of hoshin and MBO. (And I’m skipping the Balanced Scorecard from that historical). OKR consists of setting an objective, and also a series of measurable results aligned with that objective. It’s MBO by another name, and it helped you to align strategy with objectives to deliver results. OKR was explained in the following manner, using the Football analogy. And that cascaded down to the Defense, Offense, News Staff, etc. Google took OKRs like duck to water, and has been using them since then, in the same way that HP depended on MBOs, and with a similar outcome: to keep everybody on the same page, to let employees focus on results, and more importantly, to make sure that everything was linked according to that magical cascading effect. But sometime in the past 5-10 years, the MBO concept got derailed when financial bonuses were attached to them. In the historical I just covered, a bonus was never attached to the MBO. MBO is about doing your job, and it’s about how managers can manage the common goals that a company has. An MBO-based bonus derailment can happen when an employee is obsessed with achieving an objective, and has an MBO deadline that ends up costing the company a lot more than the expected bonus, therefore creating a conflict of interest. That can happen, but it shouldn’t happen. In this case, the MBO was not properly developed, and it was not properly managed. Furthermore, a bonus should not have been attached to it. Abolish programmatic bonus formulas that are tied to the MBO. Fold personal/qualitative MBOs inside the Quantitative MBOs, and deliver the individual’s performance assessment during a 1:1 performance evaluation. Don’t use the MBO on its own as a direct bonus kicker. Use it to qualify the employee for the bonus. Have a separate compensation and bonus plan that includes both company-wide top-down thresholds and managerial discretion for the right allocation. Don’t abolish MBOs. Abolish MBO-based bonuses.